AVAILABLE IN THE BOOKSTORE NOW (ONLY $35). 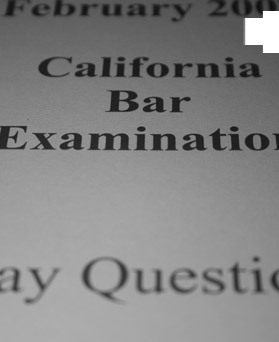 BAR EXAM 101, a Los Angeles based California Bar Exam Tutoring Company, taught exclusively by a former grader for the California Bar Committee of Examiners (passed California in 1998, Nevada in 2005, and Arizona in 2005) will guide you on how to pass the California Bar Exam, from the unique perspective of having sat and passed three separate state's bar exams and having seen how grades are handed down. Our tutors' unique approach isn't just a series of gimmicks and charts, but rather, true insight into how the graders think, what the graders look for, and what is required of you to pass the bar. Whatever program you opt for, BAR EXAM 101 can help you gain insight into how to deconstruct what you are doing wrong and reconstruct the proper way of writing and attacking each question. Bar Exam 101's series of programs suits candidates of different needs. From intense one-on-one private tutorials, to customized programs which often includes detailed essay review, to web-based classes specifically geared towards Performance Tests, we can tailor the right program to suit your needs and budget. Unfortunately, given our commitment to quality, some of our programs are very limited and candidates are screened to ensure that you can benefit from our program. Under the "Sample Graded Answer" button below, you can find samples of previously graded essays. As you can see, we believe detailed written responses greatly enhance a candidate's learning experience. In our grading approach, we not only comment on the deficiencies, but provide suggested responses as well. If you have an interest in any of our programs or have any questions, please contact us at 323-999-1887 or email us at plin@barexam101.com. Feel free to contact during the weekends and evenings as well, since we know it's a stressful time. We don't mind returning your call at any hour you specify. If we don't call back right away, we will respond promptly. We Focus on Preparation: By understanding the grader, what they look for, we can streamline your preparation for the California Bar Exam to focus on the important things. We don't feed you misconceptions about gimmicks to pass. Rather, we focus on preparing you for any scenario that you will be faced with in the exam environment. Passing the California Bar Exam takes dedication, hard work, and insight. It's up to you to provide the dedication and hard work, we can provide the insight. Performance Tests are too often the Achilles heel for candidates. Having graded the Performance Test previously, we offer a unique perspective in attacking the dreaded Performance Test portion of the exam, and provide you with an understanding of how the mechanics of a proper memorandum of points and authority, statement of facts, and opinion letters are properly set up and formatted. Performance Test seminars are provided in a audio webinar format and available for your review under the bookstore under "Subscription". Simply look under the "Subscription" tab and click on "Performance Test Exam Workshop" and you can purchase the workshop for $129.00. Please note that for an additional $59.00 you can get your PT reviewed by us with a detailed written critique of your writing. Your PT approach that most profoundly affected my chances the second time around. In my opinion, you need to stress this more, and sooner, in the process so that students can fully understand the radical change your approach brings about and have time to practice it--something along the lines of: "Everything you're now doing naturally and instinctively is probably wrong, and I'm going to show you a radically different way of taking this test that will blow your mind and cause you to go from fear to total faith in your abilities in the test . . . and the sooner you get on board that, the better." In other words, I don't think you realize how revolutionary your approach is, and just how powerful it is. You need to stress that. Right up until the time we were reviewing the first test and you told me to skim, I thought I was going to be slogging through the process in my same usual manner and maybe getting some minor tips and tricks from you. Not such a radical change. Because of that, I was tempted to put off the process of doing practice tests as somewhat less important than, say, memorization and other tasks. If you have students putting off their PT practice tests, it may be because they don't quite know what they're in for . . . radical change and empowerment! Listen to it at your own convenience and on your own schedule.